Emma has bounced from foster home to foster home since she was a small child. After being left by her mother, she pretty much can't wait to turn 18 and be on her own for good. After she sees a horrifying video of what looks like a girl being choked to death, she thinks she may have a long lost twin sister out there. She boards a bus and starts a search to see if her sister died or if that is her sister at all. When she arrives in her sisters town, she quickly learns that her life is in danger and she must play the part of her sister for her to survive and learn who murdered her. Let me preface by saying that I am a Pretty Little Liar fan. I started reading that series when book 2 or 3 came out - eons ago. 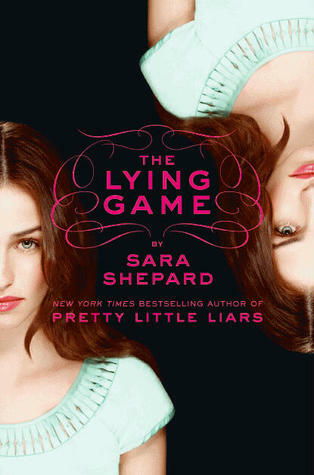 So I was more than willing than to give The Lying Game a try. In a nutshell, this is so similar to PLL that I was irritated and found myself skimming a lot. They have the same label and brand dropping, same type of mystery, same snarky remarks from the same type of snotty girls, and the same kind of mini cliff-hangers or revelations at the end of every chapter. There is absolutely nothing new and refreshing about this book. I was very disappointed. Before I started I said to myself, "I will not like this book if anyone drops a brand name in the first chapter." Sure enough, by page 10, we start the excessive, unnecessary adabrag. For example, "I love Gucci more than Pucci, but not as much as Juicy." Ugh. I get it, the girls are superficial and all about the label. I don't care, the label names were so rampant that it lost it's charm - quick. The other major problem I had with the story is the narration. The story is being told from Sutton's, the dead sister's, point of view, but I was easily confused. Sutton would explain Emma's feelings. How is that possible? Because she is a ghost, a twin? Also, Sutton would call her parents Mr. and Mrs. Mercer when Emma would interact with them. Why? They were her parents? Was the narration supposed to jump between sisters because they were twins? I had no clue.